Need an example? Next time you tune in (the show airs every Sunday on HBO) watch for the pop-up TV clips that John Oliver references throughout the show. Those clips are pulled using SnapStream! With SnapStream’s technology, the team at “Last Week Tonight” is able to quickly search and aggregate mass amounts of current, often obscure, TV content from worldwide sources. This technology, along with John Oliver’s undeniable genius for political satire, is the perfect equation for comedic gold. “SnapStream has proven itself to be the premiere product for high-volume television recording and search capabilities. 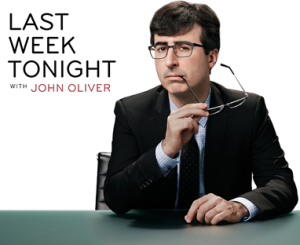 “Last Week Tonight with John Oliver” is not alone in their hunt for an efficient way to find and repurpose specific TV content. They join a host of successful shows and networks including “The Daily Show with Jon Stewart,” “The Colbert Report,” “E! News” and “The Arsenio Hall Show,” to name a few. All of these shows, and many more, use SnapStream’s clipping, content repurposing, and archival for their shows. In fact, SnapStream is known throughout the broadcast and network industries for its ability to quickly research interesting commentary, news trends, and comparative talking points. So next time you tune into “Last Week Tonight”, or any of the other shows mentioned, wow your friends and family by letting them in on the secret behind those TV clip pop-ups - SnapStream’s TV search technology. Today is the day! 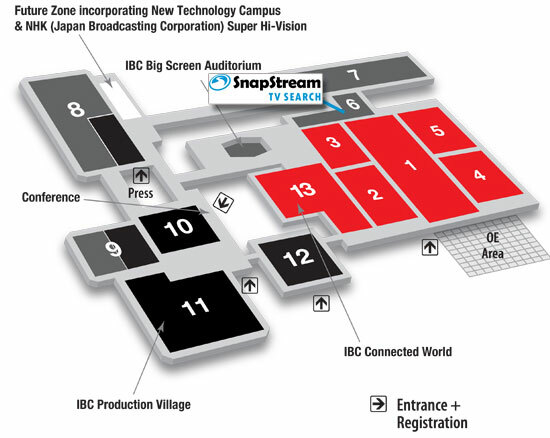 At the 2011 International Broadcasting Convention, Europe's largest professional broadcast show, SnapStream will premiere its best-of-breed TV recording and search capabilities on the world's stage, Hall 6, Stand 6.A06. This is a highly anticipated moment by many, and I mean MANY. Every day, we receive messages from organizations all over the world, looking to enlist SnapStream to solve their TV monitoring problems (which include costly clipping services and traditional, subscription-based media monitoring services). 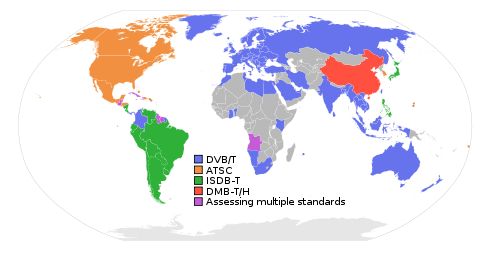 The international distinction, or technical hurdle, has long been the varying digital broadcast standards native to each country. For example: In the U.S. and Canada, it's ATSC. In Europe, it's DVB-T and PAL. We soon discovered it wasn't going to be a simple migration to transfer the complexity of SnapStream's architecture over to these foreign standards. Luckily, our engineers are incredibly smart people! So it's in due course that our team is now on the ground in Amsterdam, showcasing the first prototype of our European TV monitoring technology. The new SnapStream adds support for PAL and early support for DVB-T. Subtitles and teletext searching will be incorporated into a subsequent release. 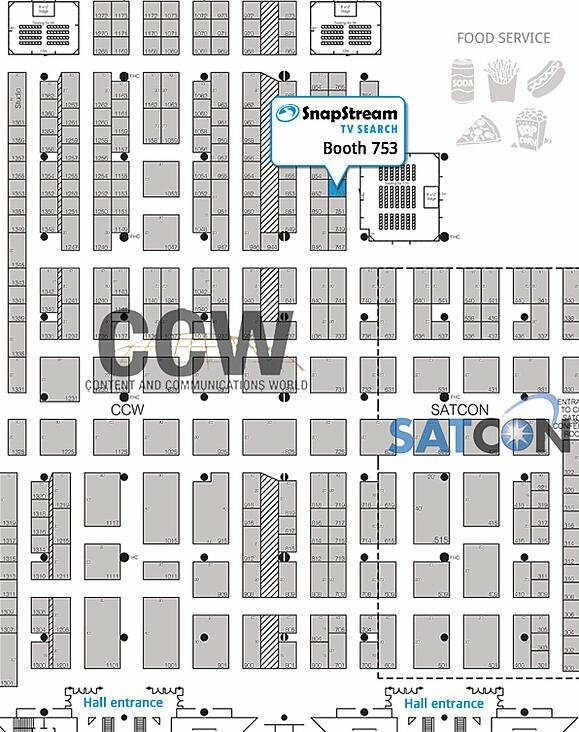 If you're at the Amsterdam RAI, Septemeber 9 - 13, you'll see up close how SnapStream enables organizations to record, log and search traditional TV (terrestrial, cable or satellite), all over the LAN. - Record large amounts of TV, from 4 channels to 50 channels or... more! If you're not going to be at the show, contact us to set up a Web demo and to glean additional information. Join us for our web seminar (June 23rd, 2:30 PM CST) specific for the communications offices of elected officials, and learn how your office can leverage TV content to interact with your constituents in a more responsive and efficient way. Many government officials across the country are currently using SnapStream to aid them with television media monitoring. 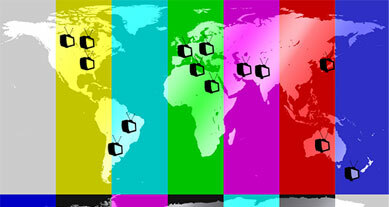 They are able to simultaneously record news channels (including CSPAN, CNN, Fox News, etc.) plus any internal cable TV feeds 24×7 and then search the closed-caption text for keyword mentions to keep track of legislation issues and media appearances. And with the relaxation of the Franking Rules this past January, they can now take advantage of SnapStream's clipping feature to increase their online video presence by uploading video clips to their YouTube, House or Senate page. When compared to TiVos/DVRs, VCRs or clipping services, SnapStream provides dramatic improvements in cost and convenience. Tired of managing VCRs or TiVo’s? Looking for a better way to monitor press coverage? Register for our special web seminar geared towards Public Information Officers in government. The City of Austin will be the guest speaker and will be discussing how they were able to cut the costs associated with maintaining 12 unreliable VCRs by moving to a more cost-effective, unified solution – the SnapStream Server. QAM/ATSC Support: Record, search and clip QAM and ATSC broadcasts. Email Clip: Create a clip and email it using the Viewscape or Admin interface. Real-Time Search: Search for mentions of interest as they are being recorded. 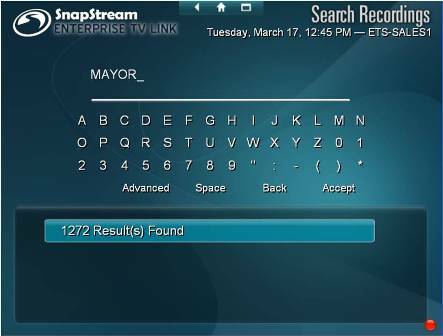 SnapStream Mini TV Search Appliance: For smaller organizations that stand to gain from searching television, but don't need the full functionality of the SnapStream Server. The NAB Show has evolved over the last eight decades to continually lead this ever-changing industry. And while the solutions at your fingertips have changed to keep pace with consumer lifestyles, habits and technologies, your aspirations to produce and deliver memorable content have remained consistent. From conception through distribution, the NAB Show has proudly served as the incubator for excellence – helping to breathe life into content everywhere. Governments use SnapStream to monitor television for a variety of reasons. In most government uses, it’s the PIOs who are using SnapStream to keep themselves, and thus the public, informed about issues that relate to the governing of the city and the reaction of the media to those issues. It is the responsibility of the PIOs to track events, issues and people relating to their specific department/agency. So as the PIO, you are responsible for being spokespeople for the City and for coordinating all other communications activities with the media and citizens. Being able to respond quickly to coverage relating to your city is key. SnapStream servers allow you to do just that. Using the TV search function, you can find whatever you’re looking for immediately, without having to scan through hours of media coverage manually. The SnapStream Servers also give you the ability to edit out just the segment you need and then email that clip. You can even have an email alert sent to you notifying you of mentions of whatever it is you’re looking for. Read more about SnapStream email alerts. Do More With Less. With SnapStream, administrators can easily control who has access to the server and what features they have access to. For a lot of government groups, for example, access to media recordings is limited to one centralized group, and so those departments that have access are often overloaded with requests for copies of news coverage – which is both time-consuming and expensive. Recently, The City of Austin was a guest speaker for a webinar we held on the benefits of using SnapStream for government media monitoring. Reyne Telles, the Media Relation Manager at “Corporate PIO” says that as the City of Austin has been on a hiring freeze and his team has been short-staffed, SnapStream has enabled his group to do more with less. Read more about how the City of Austin is using SnapStream. First, some background. The City of Austin is the 14th largest city in the United States, the capital of Texas and home to 700,000 residents. Known for its high-tech companies (for example, Dell and Samsung), its government, and seven-time Tour De France winner Lance Armstrong, Austin gets it's fair share of attention in the media. And Austin's residents are active citizens, with a great interest in things happening in the City of Austin. Accordingly, there are six TV news organizations in Austin -- ABC, CBS, NBC, FOX, Univision and News 8 Austin -- all of whom individually cover things happening in Austin City Government. The City of Austin team estimates that there are probably 150 news stories about the City of Austin in any given month -- that's about 33 TV news stories a week! "Public Information Officers (PIOs) are the communications coordinators or spokespersons of certain governmental organizations (i.e. police departments, army, city, county, state governments). They differ from public relations departments of private organizations in that many of them typically do not engage in marketing, but solely in providing information to the public and the media..."
So Austin's Public Information Offices are responsible for being spokespeople for the City and for coordinating all other communications activities with the media and citizens. Austin's "Corporate PIO" handles anything relating to the central city management and larger issues that span multiple departments. 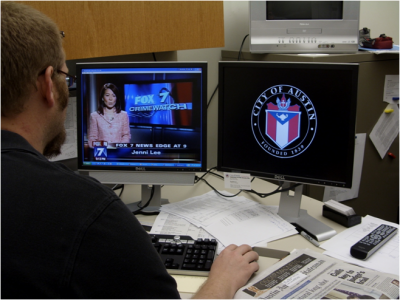 With 6 local TV news organizations and television being approximately 60% of all media mentions the city receives, monitoring TV has always been important to them. 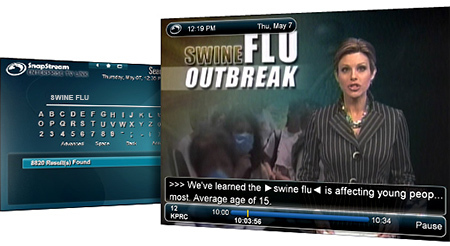 Before SnapStream, the City of Austin's Corporate PIO and 25-30 department PIOs monitored television in a fragmented fashion -- everyone was doing their own thing. 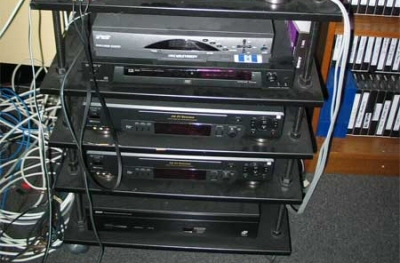 VCRs and VHS tapes: The "Corporate PIO" group and 2 other departments PIOs had large banks of VCRs that they used to record television onto VHS cassette tapes. Naturally, VCRs were a labor intensive solution. DIY PC TV Recorders: Two other department PIOs had built their own DIY PC TV recording devices. 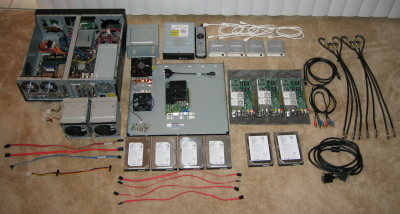 These devices requires constant upkeep and maintenance and were, ultimately, unreliable. What the rest did: All the other PIO department would call the "Corporate PIO" group asking to be sent physical VHS tape copies of media mentions they had received. This put a lot of burden on the "Corporate PIO" group to take requests, dub tapes and then physically ship VHS tapes around the city. So the way the City of Austin used to do media monitoring was fragmented (everyone was doing their own thing), expensive (lots of labor went into making recordings and then making cuts of those recordings), and time-consuming. 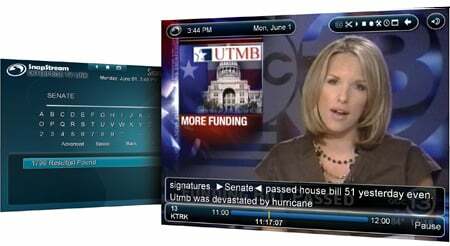 Sometime in 2007, Keith Reeves at the City of Austin saw a demonstration of SnapStream at a TATOA event and after a few more meetings, the City of Austin bought a 10-tuner SnapStream Server in 2008. The City of Austin's SnapStream Server is hosted inside of a data center in Austin City Hall and it's used by all the department PIOs across the city. The ability to schedule new recordings is limited to a few administrators. Here's a breakdown of how the City of Austin uses the 10-tuners on their SnapStream Server:Tuners 1 through 6: These are used to record every news broadcast from Austin's 6 news channels -- FOX, ABC, CBS, NBC, Univision and News 8 Austin.Tuner 7: One tuner is dedicated to recording the City of Austin's municipal channel -- this includes recordings of all City Council meetings and many of the City's other public meetings.Tuners 8, 9 and 10: The last three tuners are dedicated to record one-off newscasts (for example, if there is a news segment on CNN that the City of Austin knows they'll be covered on) and to record TV shows requested for educational purposes. For example, there was a documentary airing on TV about a particular gang that was moving into Texas and the City of Austin's Gang Task Force was able to request that video and use it for educational and training purposes. Finally, these last few tuners allow for very limited live TV viewing by a handful of users. Single solution with self-service for departments: Now, SnapStream's client software is installed on 50 desktops throughout the city. 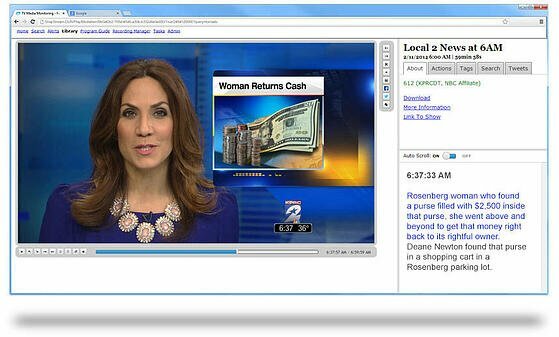 When a particular department wants a TV clip, rather than calling Austin's "Corporate PIO", they just run the client software, search for what they are looking for and create their own clip. 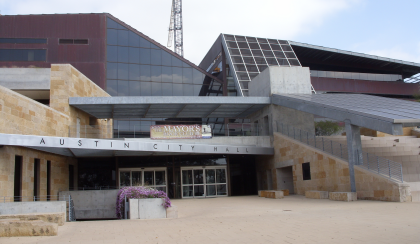 Keith Reeves, Manager at Austin 6 and the architect for SnapStream at the City of Austin says, "SnapStream has allowed us to cut down on our DVD dubs for City Council meetings and various department PIOs. Before, we'd get consistent requests for burning stuff for each of the 25-30 departments around the City of Austin! Now we just tell them, talk to the rep in your office and they can make you a clip of just that segment. You don't have to wait on us, just go do it yourself." And as other city government employees have seen SnapStream, additional users have wanted access to the City of Austin is in the process of adding additional clients to their SnapStream setup. Getting more done with less: Reyne Telles, the Media Relation Manager at "Corporate PIO" says that as the City of Austin has been on a hiring freeze and his team has been short-staffed, SnapStream has enabled his group to do more with less. And Reyne is able to respond and react more to the media. "If I get a call from a reporter at ABC asking about something that was said on another network in Austin, I can immediately pull it up in SnapStream, see what was said 10 minutes ago and get back to the reporter very quickly with a response," said Reyne.